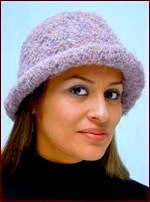 Stylish Alpaca "Riccio" hats, is made with a "boucle"-style of yarn, that gives the fabric a curly texture. Available in an extensive variety of colors-- so versatile you'll want one to go with all your sweaters and coats! It is shapely yet can easily be rolled up and placed into your handbag, or to pack for travel. Color: Ivory, Black, Light Silver-Grey, Grey, Charcoal Grey, Roman Ochre and Light Lilac (shown left and right), Dusty Rose and Cranberry Red. Composition: 76% alpaca superfine, 17% wool, 7% nylon blend.